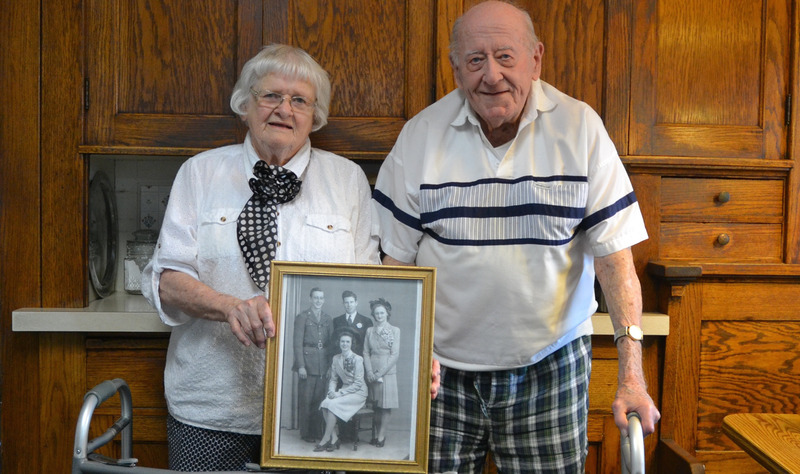 The Meyers were married on April 26, 1943, at Nativity Parish in Dubuque. They had met a year earlier when Mary Agnes agreed to do a favor for her friend and fellow Girl Scout, Elizabeth “Libs” Meyer, who was looking for a dance partner for her brother-in-law Lowell. When she got two free tickets the following day for an upcoming dance at Melody Mill ballroom near Dubuque, Mary Agnes asked Lowell to go with her. He said, “yes,” and they have been together ever since. 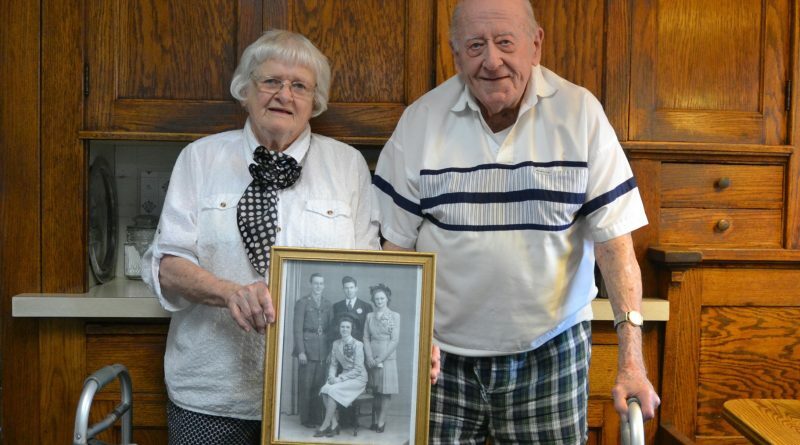 After they were married, the two native Dubuquers continued to call Dubuque their home, only living away from the city during Lowell’s service in the U.S. Army. Lowell, or L.J. as friends and family like to call him, retired in 1992 as the president and chief executive officer of Kretschmer Tredway Co. in Dubuque. Mary Agnes retired the same year from the Dubuque Community School District, where she had been a secretarial associate. After retirement, the couple spent much of their golden years traveling as part of a golf foursome. Lowell and the other three men in the group would golf, while their wives would enjoy lunch and shopping, and in the evening, they’d all meet back up for dinner together. “We had the most wonderful, happy years after retirement,” Mary Agnes remembered. Today, Lowell, 94, and Mary Agnes, 92, still live in their own home on a ­quiet street in Dubuque. “If it weren’t for our children, we wouldn’t still be able to be here,” Mary Agnes said. Their daughter, Maggie, lives with them, having moved in after she lost her husband in 2009. Their sons stop by frequently to help with yard work and maintenance on the house. One of their grandsons takes Mary Agnes grocery shopping every Thursday. “They do so much for us,” she said. The Meyer’s home is the scene for many impromptu family gatherings. Children and their spouses, and sometimes grandchildren and other members of the family too, will visit in the evenings, especially Sunday evenings. “It’s nice. You never know who will stop by. 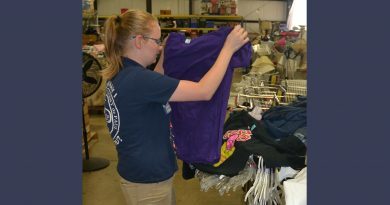 It keeps us all together,” Mary Agnes said. In addition to family, the other major focus of the Meyer’s 73-year marriage has been their Catholic faith. “Our strong faith has played a big part in our marriage – a big, big, big part,” Mary Agnes said. She and Lowell have been longtime members of Nativity Parish, and though Lowell is no longer able to attend Mass because of a bad knee, Mary Agnes still goes on Saturday nights. She said the church community they formed at Nativity has always been an important part of their married life. 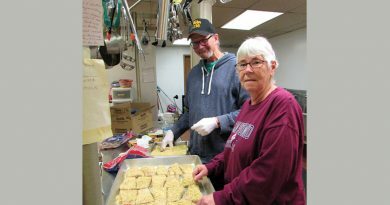 The couple was involved and volunteered for many different parish activities through the years, and Mary Agnes continues to help whenever Nativity has a bake sale, cooking up jars of her famous hot mustard, which has earned her the nickname “The Mustard Lady” at the parish. Lowell, who was listening as his wife spoke to The Witness over the phone, wanted to add one additional piece of advice for young couples just starting married life. “Always live according to your means,” he said. On Sunday, April 24, the Meyer’s anniversary was celebrated at the 9:30 a.m. Mass at Nativity Parish. Mary Agnes was there with the children, and after Mass, she and Lowell enjoyed coffee and doughnuts at their home with family and a couple of close friends, including the woman who was the bridesmaid at their wedding. 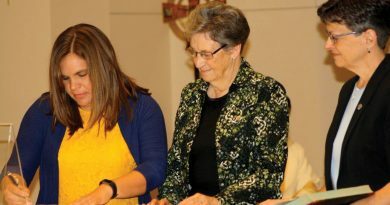 Mary Agnes said they would also be cele­brating on the evening of their anniversary itself, April 26. “That will be party time!” she said with a laugh. Photo by Jill Kruse/The Witness. 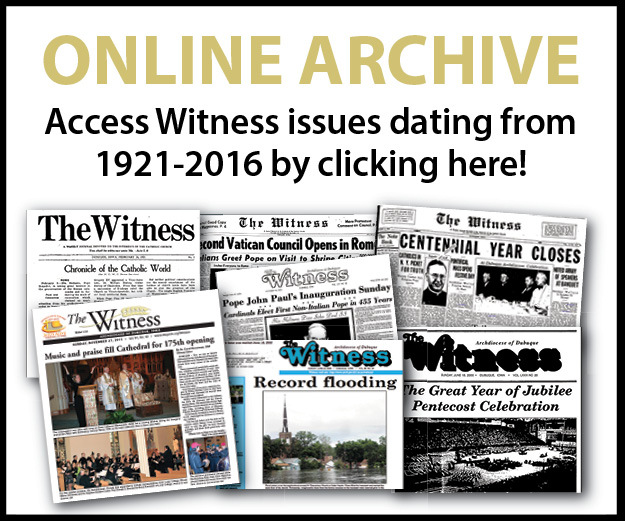 Mary Agnes and Lowell Meyer, members of Nativity Parish in Dubuque, celebrated their 73rd anniversary on April 26. They are shown above holding a photo from their wedding in their home.